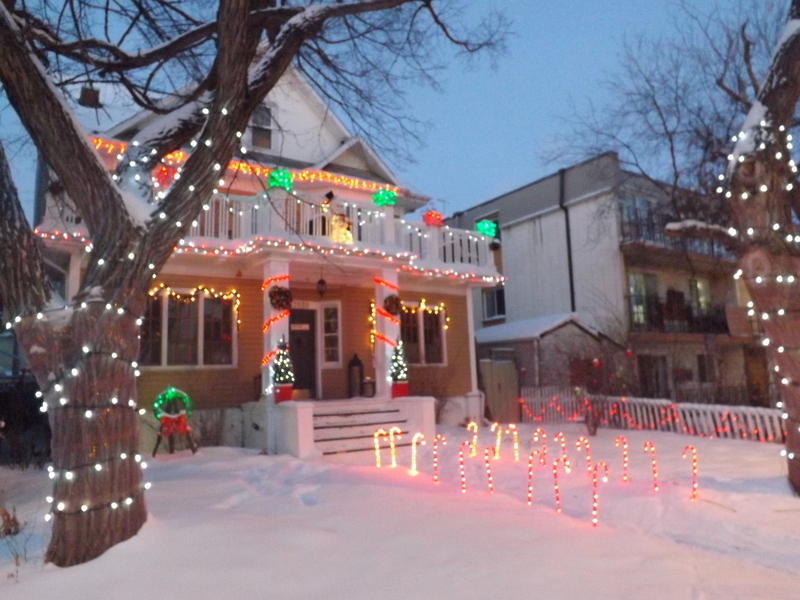 I may have said this before: I love Regina, and Cathedral Village is definitely the best bit of it! I have definitely said this before: It is frigging FREEZING. Eyelash-freezingly, thigh-numbingly, frost-bite-inducingly, Thermos-coffee-mug-thwartingly painfully, dangerously cold!! Sunday had a high -31 celcius. (-24 fahrenheit for American imperialists) and that was without the windchill. With the wind, it was -48, which is -54F. Yep, you guessed it, colder than the surface of Mars. Again. I am not going to do another post about coldness though, I promise. My parents came out here for Christmas again, and they now expect a white one – well, they certainly aren’t going to get it at home, are they? We had a lovely holiday, (as always) but it definitely wasn’t long enough. We did have some excursions, including a fantastic trip to Moose Jaw to Temple Gardens Spa, where it’s possible to bathe in hot, natural spring waters, (on the third floor, I might add), but then swim outside and steam in the sudden rush of the minus-ridiculous temperatures of the snowy roof patio. Amazing experience!! Dad’s hair froze, so we spiked it up for him…. We also spent a while SKATING. I LOVE skating!!! Miranda loves it too! I was a bit wobbly at first -I didn’t actually get very good at it last year, but at least i can remain upright and propel myself along. Miri is getting very proficient on her little bobskates. We found there’s a rink at the park on McTavish st in Cathedral so we went there until we were joined by a junior hockey crowd and were humiliatingly overtaken by 6 year olds…. never mind, the Victoria Park rink, ten minutes walk in the other direction, is now open and is relatively hockey-free. 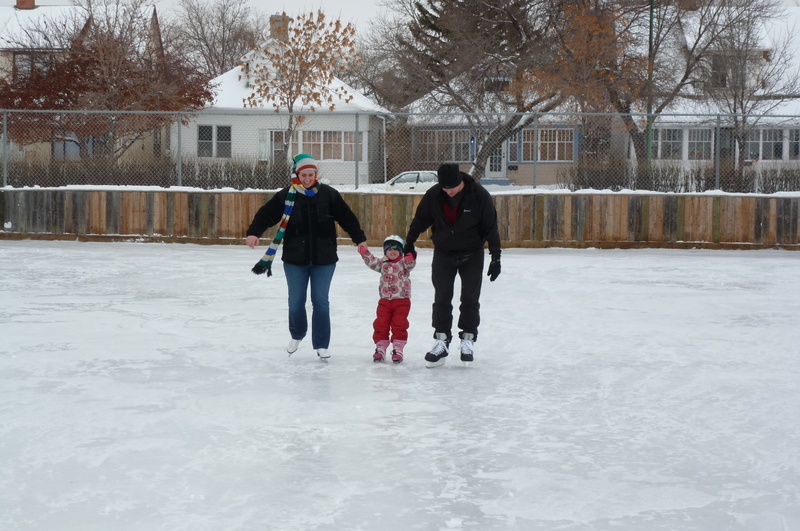 Best of all, they hire out skates (for free) and even Mum was (almost) brave enough to have a go! The rest of the time, we went for Cold Walks around the neighbourhood, being Beer Elves and making deliveries to Amy, or bringing the Christmas Octonauts magazine to Jeff and Bryony all the way from the UK. Miranda got a SLEIGH from Granny and Grandad for Christmas, which is absolutely brilliant – so much easier than negotiating the pushchair through the snow. Of course, we had to test it, so we bundled her up and went out to admire everyone else’s Christmas lights , most of which were considerably more impressive than our own! 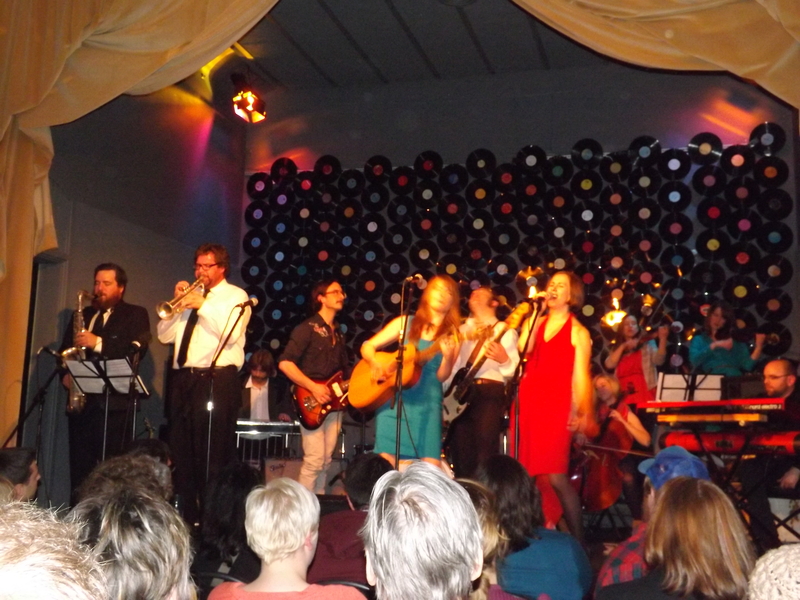 Finally, on our last weekend together, we went to the 13th Ave Records Rendevous at the Artesian. Loads of local bands, several with interchangeable band members, and seemingly trying to play “how many musicians can we fit on stage at once?” It was an excellent night (possibly not as good as the previous year’s – too much of one band, not enough tubas involved?! ), and so good to see so much live music all from one small area. There was an after party at the German Club afterwards, which is a long way from Cathedral. The solution? Get the host, a hipster-with-a-megaphone to usher people on to a (free) bus, along with half a brassband and a country singer who stole the aforementioned megaphone, and get the Music Bus all the way across town. Wonderful!! 13th Ave Records operates out of a shop called Buy the Book, two blocks from here. Very sadly, the owner of both, Chris, announced at new year that Buy the Book is closing down soon. Next came the news that my very favourite coffee shop is also closing. What is happening to 13th avenue?? This is Cathedral! If small businesses and community-minded,sightly hippy folk can thrive anywhere, it is HERE. I have a feeling I will be writing more about Cathedral coffee shops soon though, and I refuse to get sad about this. I am staying positive. 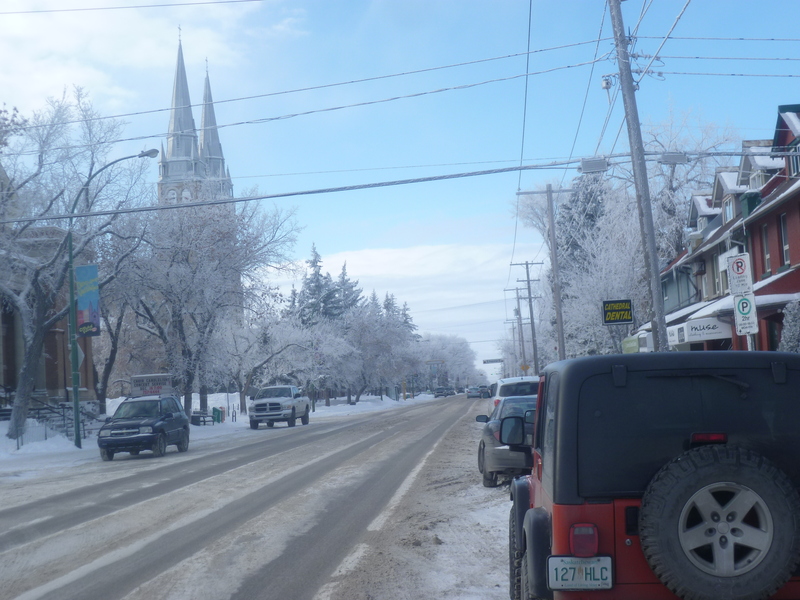 Cathedral is a beautiful, fantastic neighbourhood and I wouldn’t want to be anywhere else. Hi, I will be moving to Regina shortly taking up a job with a Canadian employer in Spring and your experiences with employers messing you about has me worried. Any chance of having a quick email chat about your observations? Sure, if I can help! Don’t worry though, i like to think my experiences are exceptional, hopefully. I do know others who moved over here with no problems whatsoever! Just maybe avoid a few local coffee shops! 🙂 give me a shout at gplus.to/beltownsend and good luck with everything. The wait is the worst part! 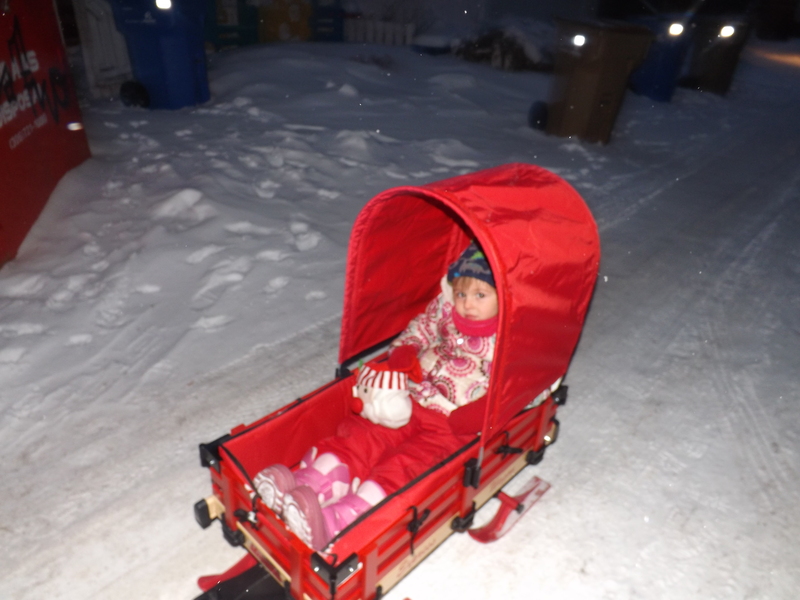 Your daughter’s sleigh is adorable and I agree much easier for you than a stroller. It’s brilliant! Just took her to preschool in it. It looks kinda Amish somehow!!! We just found it in Canadian Tire actually.